Sorry about the mysterious appearance this morning of a post that was nothing but a title and a raw URL link. 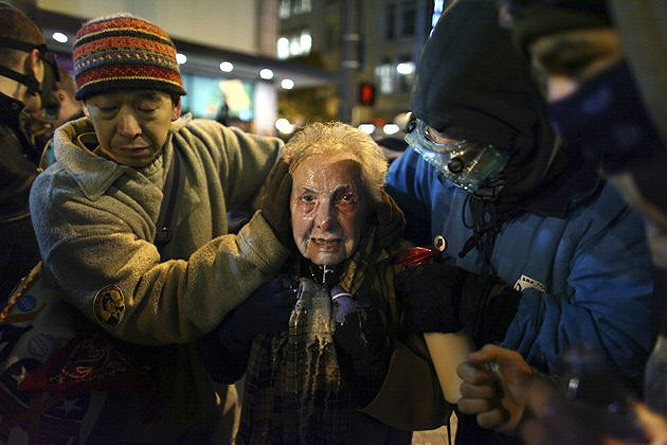 I’m drafting a post based upon the Atlantic’s chronology of police violence against OWS demonstrators, and, in the very early stages of putting it together, I hit the publish button rather than the save button and didn’t notice till much later this morning. I hope to complete it very soon. It’s important to get it right on the issue of violence at Occupy demonstrations. First, because it provides context for the remarkable courage the demonstrators have shown despite unrelenting provocation by police, who throw punches and swing truncheons as though it were sport, and who seem to resort to their weapon of choice, pepper spray, as readily as a traffic warden issuing a ticket at an expired parking meter. As a matter of fact, it is illegal to pepper spray a prison inmate without just cause, but spraying peacefully assembled protesters in the face at close range, that’s evidently okay. The pepper-spraying of students at UC Davis on Friday, and the uncanny silence with which they greeted the Chancellor of the university who was responsible for it on Saturday, is a testament to the trials they face, as well as their consistently peaceful response to them. Another reason to get it right is that the other day on Fox News I saw a couple of Gila monsters in thousand dollar suits hissing and thrashing their tails about how “it is time to end the violence on the streets.” Yes, it is. However, they never mentioned that the violence it is time to end is coming from the police, not the demonstrators. This entry was posted in Current Events on November 21, 2011 by Michael Happy.